It’s a beautiful, sunny day in London. A velveteen grassy green field calls out under pure blue skies and lazy clouds. And… you can’t see your laptop in the glare, you’re out of battery, and your music studio is underground. Not only will you be miserable, you’ll be playing alone. 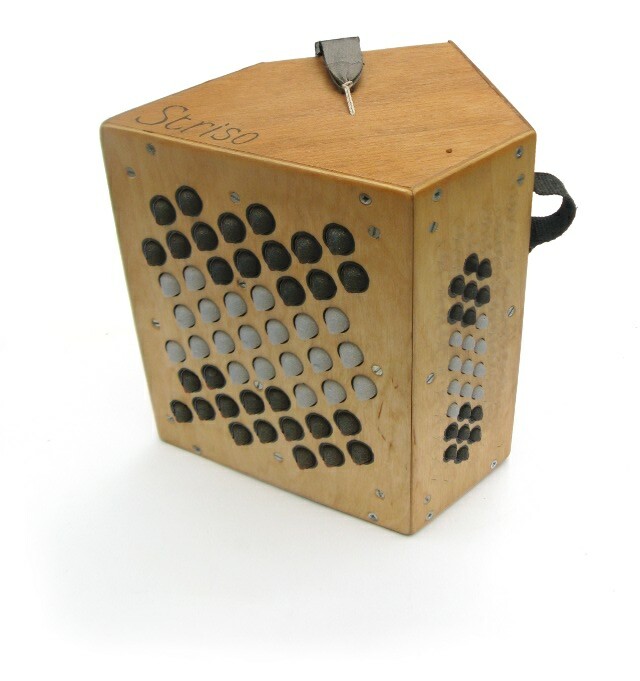 So, kudos to Striso, the Italian-dubbed (but Dutch-built) squeezebox, evolved digitally. And it’s an electronic instrument that you can still don to serenade your friends in a picnic. Looking a lot like a free-reed instrument such as the bandoneon or concertina (or, yes, accordion), it’s in fact a purely digital instrument. Battery powered, there’s a digital microcontroller inside calculating the sound and piping it to internal speakers. But thanks to low power consumption, all of that runs easily on batteries, and the built-in speakers are loud enough you don’t need an amp. As a result, this is an instrument you can play anywhere; you can even busk with it. Oh, fine, you say – but then I could just use an accordion, right? Well, that digital soul inside gives you some other advantages. For one, this could sound like anything you want. The instrumental code is open source, built in the rapid coding library for sound, Faust. That allows the Striso’s sound itself to be tailored to the control interface. Van der Toren says he will keep this a self-contained instrument, but the code itself could be used to produce other instruments with other sounds. Second, the gumdrop-like buttons are impressively expressive, able to put nuances of sound right beneath your fingertips in a way even the conventional instruments couldn’t. The Striso is also a compelling exploration of key layout, working with the surprisingly intuitive DCompose layout. That arrangement strikes a nice balance between finding the key you’re in and deviating from it. It’ll take practice to learn as will any layout, but it’s nice both to easily find fourths and fifths and still work out where the scale is. I met creator Piers Titus van der Torren at STEIM in Amsterdam late last month; now, he’s at the NIME conference in London (at Goldsmiths). He gives us a full tour of how this works.